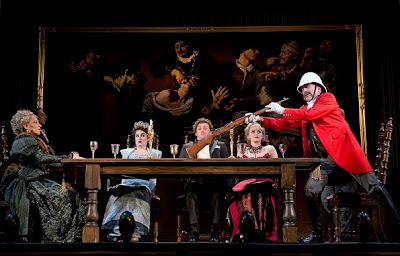 Joanna Glushak, Lauren Worsham, Bryce Pinkham, Lisa O'Hare and Jefferson Mays in "A Gentleman's Guide to Love and Murder." Photos by Joan Marcus. KNOCKING off relatives in order to take one's rightful place in the family can't really be criminal, can it? 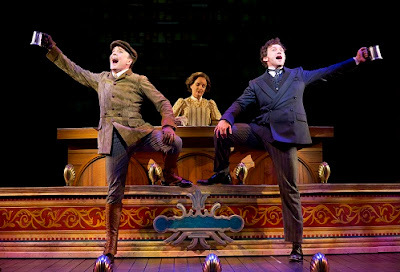 "A Gentleman's Guide to Love and Murder" issues a resounding acquittal. The play is in an open run at the Walter Kerr Theatre and produced in association with Hartford Stage and San Diego's the Old Globe Theatre. Monty Navarro (Bryce Pinkham), the very charming disinherited heir to the D'Ysquith earldom, systematically dispatches the other eight (all played by Jefferson Mays) in line for - or, as in the case of Lord Adalbert, holding - the title. His is a mission of revenge for his mother's unfair banishment, as well as a claim to his birthright. (See video below). Adding to his troubles, Monty yearns for the coquettish Sibella Hallward (Lisa O'Hare) who in turn yearns for riches and comfort he seemingly cannot provide. As it turns out, Monty's eccentric cousin, Phoebe D'Ysquith (Lauren Worsham), proves to be a perfect match for the up-and-comer. While most of Monty's cousins continue to shun him, D'Ysquith, Sr. takes him in as a clerk in his brokerage. Monty thrives there, despite being unschooled and impoverished. Meanwhile, he also hones his other newly discovered talent. Poison would be the Victorian fallback, but Monty is far more inventive at offing his relations. "A Gentleman's Guide to Love and Murder" carries forth in the farcical tradition of its antecedents. It is based on the same book by Roy Horniman that engendered the Alec Guinness film, "Kind Hearts and Coronets." Sibella Hallward (Lisa O‘Hare) is the object of Monty Navarro’s (Bryce Pinkham) desire in "A Gentleman's Guide to Love and Murder." The names have been changed (from D'Ascoyne in the film) in Robert L. Freedman's musical play to protect the guilty. RLF and Steven Lutvak are responsible for the clever lyrics, and SL has written the lovely tunes. "A Gentleman's Guide..." is imbued with a lovely soft touch of vaudeville, not just in its songs but in Alexander Dodge's puppetstage-like sets. BP and JM lead the way with their versatile and elegant performances. Standing out in supporting roles in the fine ensemble, expertly directed by Darko Tresnjak, are Joanna Glushak as Lady Eugenia, Adalbert's peevish and crotchety wife, along with LW and LO'H. Jefferson Mays, Jennifer Smith and Bryce Pinkham figure in "A Gentleman's Guide to Love and Murder." There is plenty of wow in the special effects (projection design by Aaron Rhyne) and the handsome period costuming by Linda Cho. Despite all the wattage, however, "A Gentleman's Guide..." is light and trifling fare. Visit http://www.agentlemansguidebroadway.com to learn more about "A Gentleman's Guide to Love and Murder."